6 sheds complete Keter’s Factor range, spanning from 6 x 3 feet in size up to the roominess of an 8 x 11 footer. 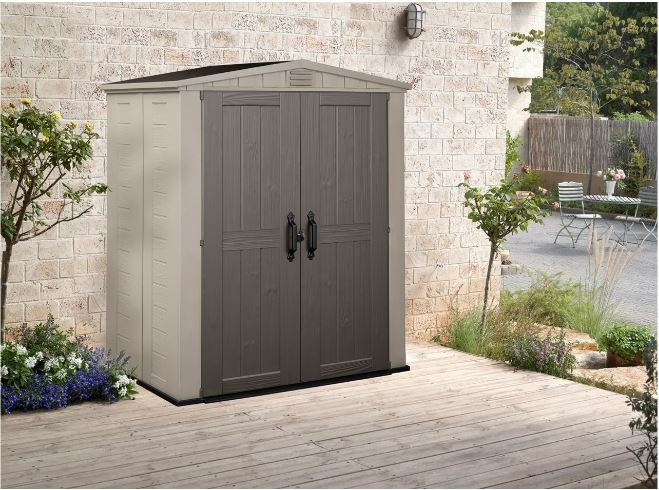 Factor’s outdoor plastic storage sheds provide an affordable solution for where space indoors is at a premium, organising more room in the home & garage by conveniently storing outdoor stuff where you need it most – Outside. Factor’s strategy is to refrain from equipping their sheds with sparkly quality finishing touches in order to retain their competitive edge however combining impressive world-wide sales with solid feedback justifies their global presence. Size of storage facility depends on one’s situation, Factor’s provide plenty of solutions through a range spanning variable dimensions. We gladly departed from the conventional outdoor wooden storehouse due to time restraints with regards to ongoing conservation issues. Substituting with a make-up constituting durable resin has been a great decision for our behalf, relinquishing upkeep duties to a thing of the past. 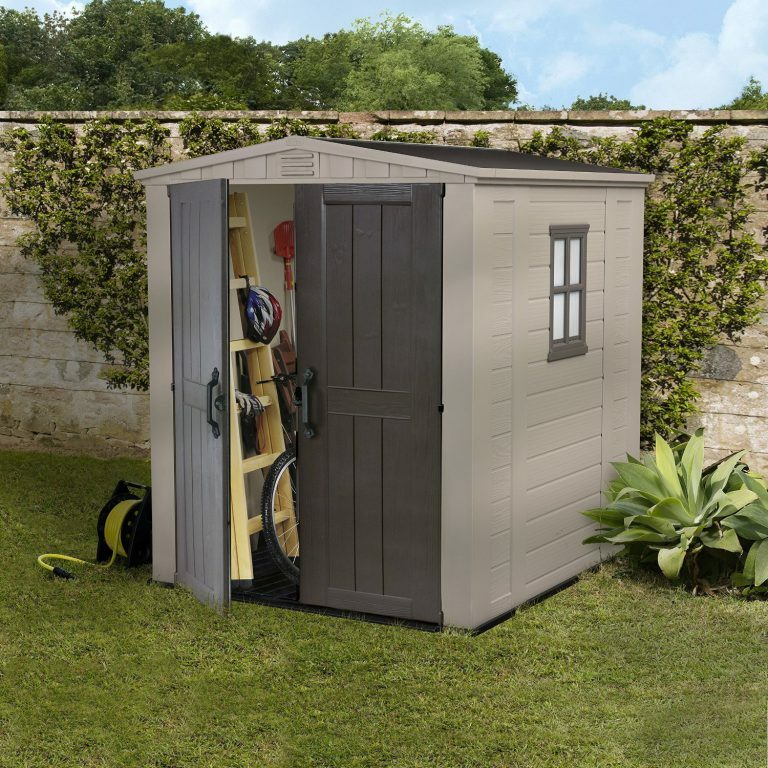 The mere maintenance nowadays involves clicking the shower connector onto the hosepipe and delivering a leisurely light pressure wash.
Accomplishing a flat-pack plastic shed installation becomes a very straightforward procedure if you adhere to the foundation rules. Although initially daunted by the sheer scale of the project we complied by preparing the correct foundations, presenting us with a quick clear-cut assembly. Foundation rules are explained in the assembly section further down the page. This page describes Factor’s construction and composition accompanied by an image and video regarding each Factor shed. I’ve included links to prices meanwhile each shed’s title links to an in-depth review where additional information, images and accurate internal/external measurements are provided. Chuck away those old rusty varnish tins! The fascia’s arrangement comprises chunky weather-resistant panels manufactured from polypropylene into a robust construction, designed to resist the unsightly appearance dents exhibit. Additional UV protection blends into the polypropylene to combat the forces of sunburn producing fractures to the skin further to resisting colour fade thereby escaping unsightly bleaching. Following the manufacturing mix, the molding procedure creates an attractive wood-alike texture displayed in panel formation constituting intricate grain details embedded within the surface. Presented in matt beige shade overcomes glossy plastic looks yet displays with a stylish presentation to complement the backdrops of gardens, patios or home-yards. Factors weatherproof constructions are additionally reinforced with steel infrastructures as the shed sizes increase, enhancing their stability meanwhile polypropylene remains non-reactive to changeable weather forces thereby continues immune from decomposing through rot, whether situated in freezing snowfall, stormy showers, red hot sunshine or long-term damp environments. If you’re determined to sidestep the hassles associated with continual wood-stain duties on an annual basis, Factor’s are not designed for painting or varnishing. Refreshing their virtually maintenance-free shell merely requires an occasional wash – Yippee to that! All Factor roofs are apex in design resulting in an efficient drainage system. The aslant pitch ensures rainfall runs off with immediate effect and devoid from the occurrence of puddles developing meanwhile an adequate overlap stops rainwater dribbling inside virtue of the walls underneath abutment. The make-up regards a thick composition of polypropylene that’s tinted in dark grey shade. Factor sheds maintain their competitive edge therefore are absent from stylish slate effect roof-tiles seen topping the more expensive models however comprising the same weatherproof credentials of resin are an integral part of their manufacture. 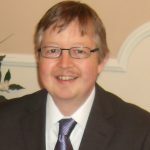 Polypropylene assures defence to withstand decomposing when exposed to long-term adverse weather conditions, the antithesis of roofing felt’s short-term limited lifespan. A polypropylene make-up remains unaffected through weather-attack meanwhile unsusceptible to decay ascertains they’re not subject to future re-roofing dilemmas. The roof arrives in flat-pack sheet form requiring assemblers to align the holes and secure with screws around the roof-framework. The larger the shed, additional steel beams deliver a truss system further bolstering support. This supplementary enhancement produces a stout topping, Factor sheds are capable of carrying snow-loads in excess of 75 kg/m. An integrated resin floor provides many advantages when comparing against the traditional wooden alternatives. When water stagnates underneath or puddles a shed floor this inevitably leads to the demise of a wooden structure due to rot decomposing however a resin composition resists such decay providing long-term protection when laid in damp conditions. 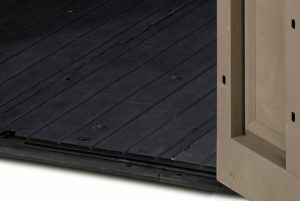 Factor floors are manufactured from polypropylene & molded into a thickset resin bed meanwhile additional toughening elements blend within the manufacture providing a hard-wearing surface able to subsist demanding pressures associated with wheeling in weighty equipment and sorting heavy-duty storage. The floor arrives in sheet formation & interlinks with adjacent panels making up the base expanse meantime the walls interconnect within the outskirts of the floor by virtue of interlocking thus creating a true built-in feature. Integrated resin floors put an end to outside debris blowing through, the progression of rainwater puddles developing inside and blockade a critter’s walkway thereby aid to maintain a clean internal environment further to being damp resistant, problems most metal sheds are susceptible to as they seldom have floors incorporated, requiring a wooden substructure to be fit unless you opt for Asgard’s steel constructions whereby the floor is an integral part of the structure. All Factor sheds with the exception of the 6 x 3 ft model include an attractive poly-carbonate squared-effect window delivering natural daylight inside. 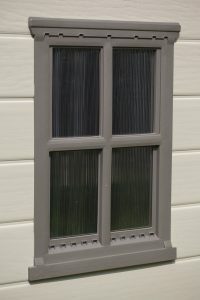 The window can be installed on either side to coincide with surroundings, requiring to work out which side suits the location prior to assembly. Shelf supports and shelves are inclusive on most models however their storage capacity remains rather limited. We took advice from previous shed assemblers opting to purchase large plastic stacker boxes along with installing a bank of stand-alone shelving down one side. Each individual review explains whether shelf supports and/or shelves are included for that particular model meanwhile it surprised us how much additional storage free-standing shelves can accommodate within a shed exploiting the generous internal height plus they support weighty amounts. Worth considering if you’ve accumulated an abundance of outdoor gear like we have. Over 2 metres of internal height enables easy movement around inside, headroom increases further for the 8 ft wide models eliminating that cramped-over scenario meanwhile any association of a hemmed-in feeling is overcome by the full length skylight embedded within the apex ridge illuminating daylight to the interior. Ventilation is built into all Factor sheds. Integrated opposite sides front and rear they generate a continual fresh air current to distribute the interior creating a preserved atmosphere essential to protect storage in order to overcome sweaty atmospheres developing saturated walls. A double door entry system accompanies all Factor sheds including the 4 x 6 ft model whereby a secondary slim door panel next to the main door generates a tad more access. Regarding the 4 x 6 ft Factor shed, the doors can be installed to open either way, requiring to work out which way the door swings open is best to aid your services and location prior to construction. The door manufacture comprises a similar make-up to the facade whereby thickened polypropylene is molded to resemble stylish wood panelling comprising a detailed grain texture flowing through the surface exhibiting taupe shade, integrating modishly with the facade’s beige tint. Each door contains a large grip-able handle whilst a leaver secures into the clasp’s groove to ensure closure. Security-wise, a padlock slots into a hole presented within the clasp to enable locking. Padlocks are not included. Virtually maintenance-free, Factor sheds do not rust, rot or peel and will never require re-varnishing or re-roofing meanwhile UV protection prevents cracking and fading during exposure to sunburn. A wash down when dirty constitutes their conservation-free benefits. Manufactured from 100% recyclable Polypropylene attains environmental friendliness, trumpets out Factor’s green credentials. 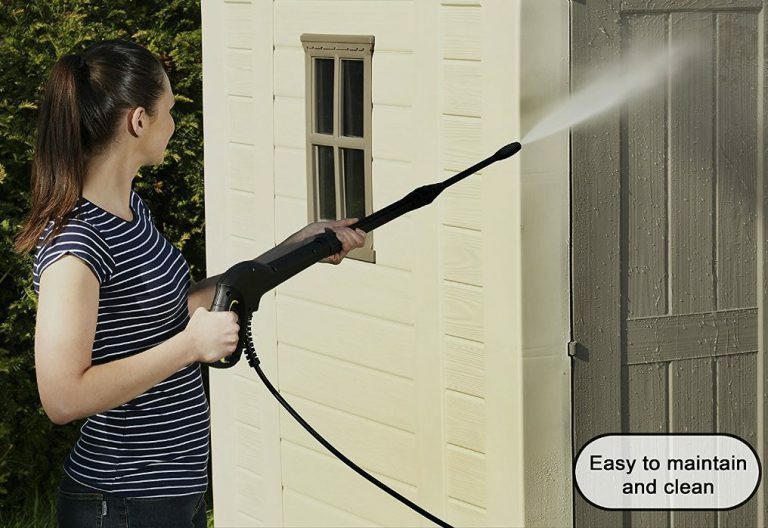 Most of the time plastic sheds only require a light spray-hose down. If grime or mildew becomes ingrained a soft brush and a splash of detergent accomplishes the removal of stubborn marks. Never use abrasive cleaning materials like wire wool, this may damage the surface of the plastic. Assembling Factor sheds takes two people approximately 3 hours to a day dependant on the shed size. Common household tools construct all these sheds meanwhile assembly requires following & implementing the sequence stepped out by illustrations presented within the instructions. Unfortunately there are huggings of screws but something’s got to hold them all together. Construction entails interlocking the panels and lining up the holes to the steel framework prior to securing with screws. To accomplish the ease of a perfect construction it’s imperative the shed stations on a solid level substrate however there’s many choices including wood decking, concrete, maybe existing paving slabs, asphalt or tarmac with emphasis relating to being level. Best not to side-step this stipulation – Those who adhere to the manufacturers advice usually write wonderful feedback. Level footings deliver a straightforward assembly due to the panels ease of alignment. 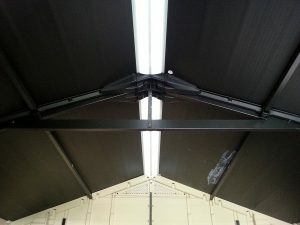 If you’re not level on the base, alignment of the panels becomes challenging towards the roof. A level base delivers a vertical stance ensuring the doors align plumb, swing open and close correctly. Level foundations accomplish a perpendicular stance ensuring equal roof pressure weighs down across all sides. Solid foundations provide the ideal substrate for the floor to survive heavy duty services. Once the shed is built, best practice is to anchor the shed down onto underneath’s substrate through the indentations presented within the resin floor. Anchor bolts (not included) rigidly secure the storehouse increasing wind resistance levels many fold – An advisable measure to undertake. 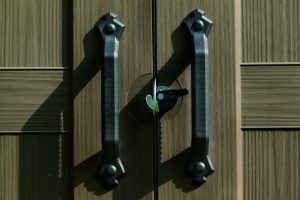 Factor sheds maybe lacking in some final quality finishing touches suchlike quality door hardware and stainless steel locking systems inclusive with many competing manufacturers however everything else is manufactured to provide weather-resistant sturdy fascia panels along with an undemanding duty to restore their shine. 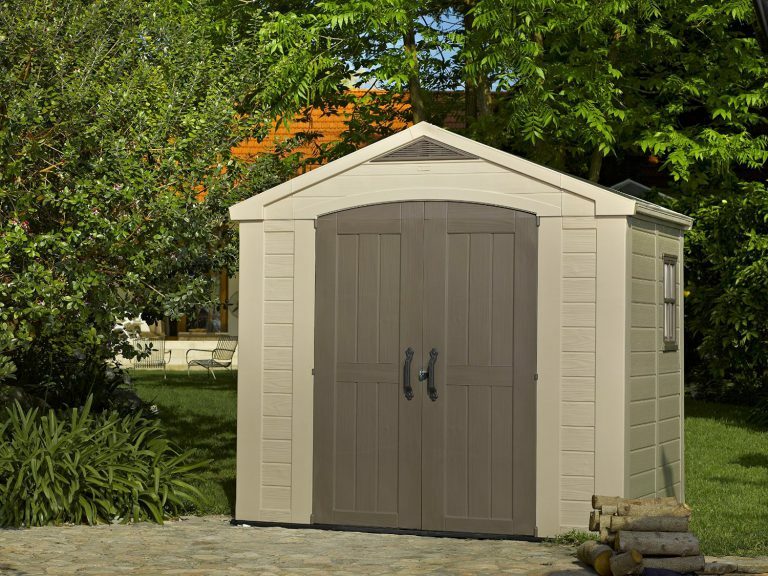 Where Factors pressure their competitors however regards their fair value for money for every shed within this range and sizes to suit a whole range of storehouse ideas for positioning in garden, home-yard and patio locations, the reasons for their global sales. Excellent feedback along with an impressive 10 years warranty cover provides plenty of reassurance. 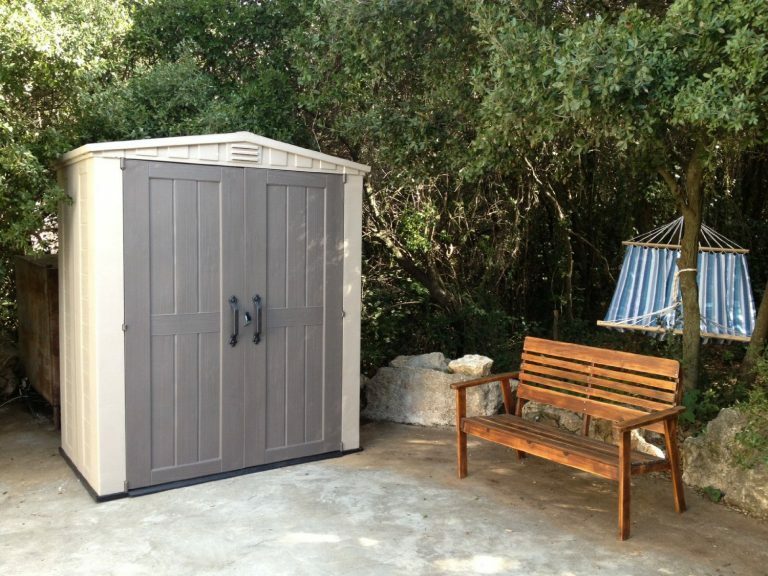 Hope Factor’s outdoor resin storage sheds inspire your storehouse ideas. 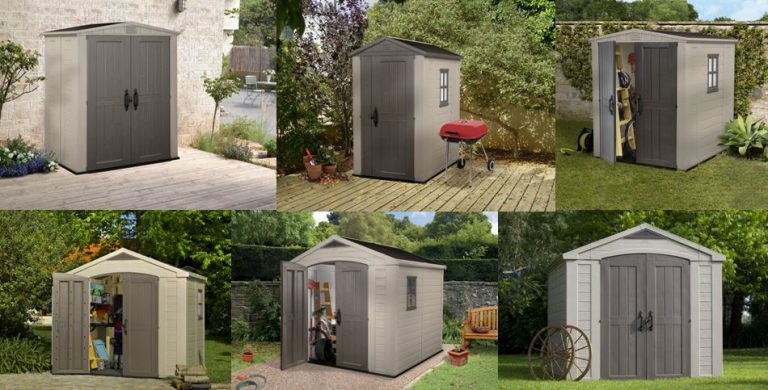 Please share Factor’s range of sheds. Thank you! I like plastic sheds over metal because the metal sheds always rushed after a while. I bought a metal shed once, it’s only last for one year. The plastic construction makes it look pleasant to the eyes and increase value to your house. These are a great shed, I know because I have one. Metal sheds can look unsightly once corrosion sets-in meanwhile upon commencing the role of re-painting with oil-based primer followed by gloss, the job becomes an ongoing annual requirement to maintain their presentation. I have been through the same notion with a metal garage door that started to rust. Unfortunately the paint colours soon diminish over a year and they lose their bloom with standard oil-based paints, the reason Asgard’s steel constructions are powder-coated in coloured polyester after being galvanised as this ascertains longevity against colour fade, the reason they’re back with 10 years warranty. The new methods of molding techniques are creating remarkable similarities to wooden conformations today, some recent entrants embody the grain effect just like wood along with accomplishing the same shade too – Clever resin engineering. Factor’s do hold back accomplishing the same finish the new innovative designs are developing however this is purely to remain at their peak of competitiveness and maintain their global sales. 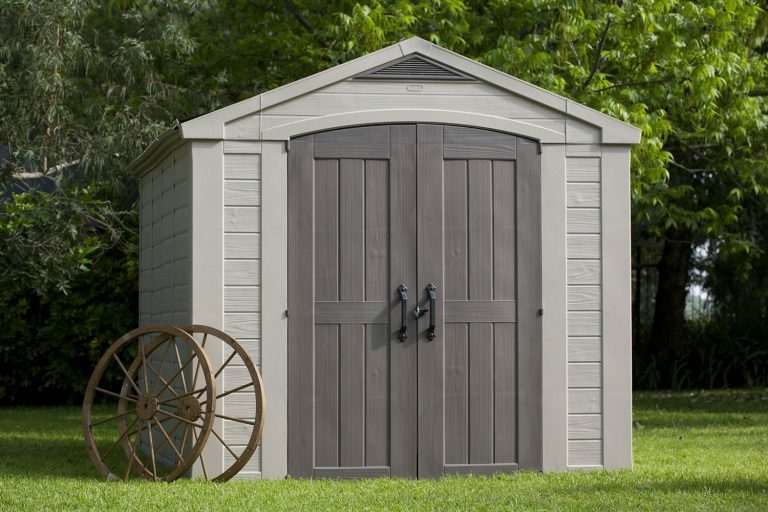 Keter have recently released two new designs – Oakland sheds which are fully customizable if you wish to cover up their rustic appearance and brighten-up the garden with your unique colour schemes along with Fusion’s composite range, delivering the best of both worlds if traditional appearances are preferred. Thanks for letting me know, you too have the plastic variety. I agree, they have pleasant eye-appeal and do enhance a home-yard’s outlook meanwhile their pure benefit relates to how the quickness of a wash swiftly restores their presentation. Great, Great, Great, these sheds looks amazing and very very good quality. 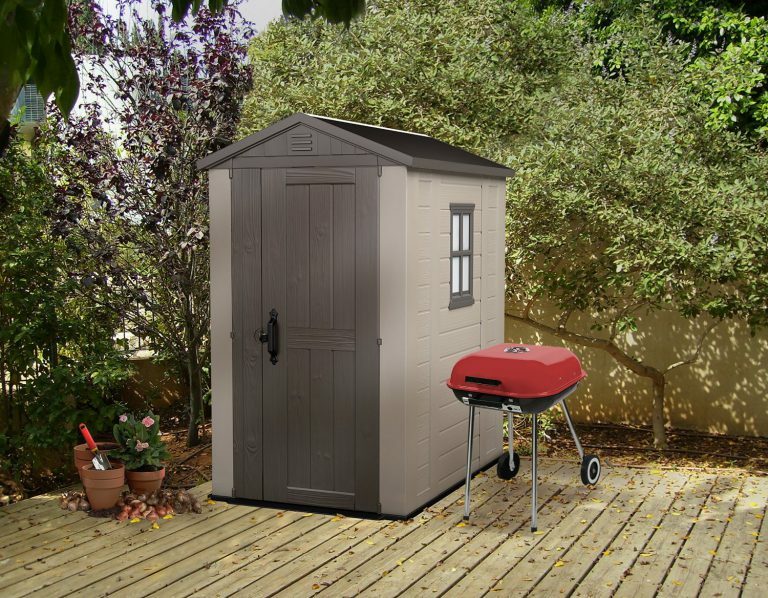 Shed made of wood and other materials are very difficult to clean and we can just do a good wipe to made them look tidy and at the same time these shed can accommodate a lot of stuff as they are compact yet with a lot of space inside the. Hey Sarah, Factor sheds do cut back on many additions suchlike impressive handles, windows that open, stainless steel locking systems, slate effect resin roofs and ultra stylish exteriors many of their competitors furnish their constructions with however accompanying sheds with these fitments does demand a higher price. Factor’s incentives are to deliver a smart, stylish budget range of storage solutions that deliver weather-resistance. You are right with regards to cleaning, a swift occasional hosepipe shower refreshes their appearance in quick time wheres when comparing to wood, they simply don’t wash the same, rather they necessitate an annual re-coat of wood stain or paint to restore their presentation yet this duty is imperative to undertake in order to keep nourishing the wood to accomplish conserving. 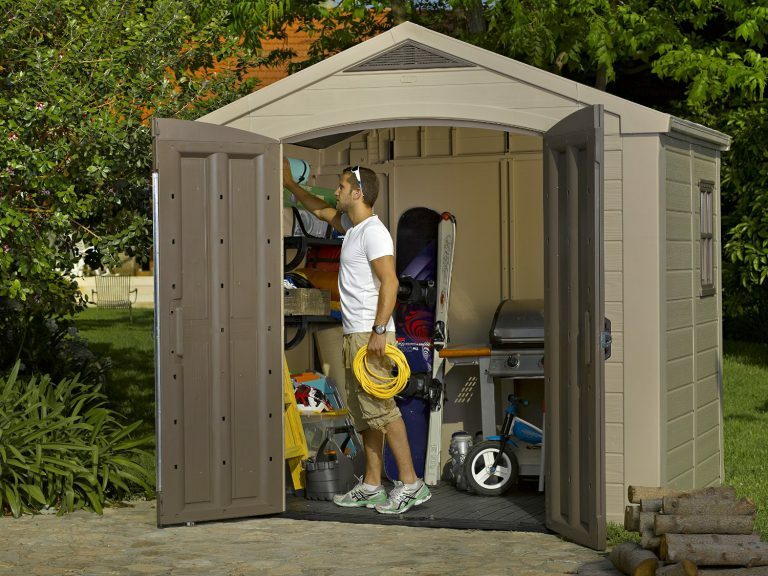 There are 6 sizes of Factor sheds spanning from 6 x 3 feet for situating in small garden placements or patio locations up to 8 x 11 feet providing super spacious internals for sheltering an abundance of outdoor gear. There’s dimensions to suit the majority of storage circumstances whilst retaining fair value for money – You get a lot for your buck. I did not even know that you could get sheds made out of this material. I have been looking at either having a shed made out of wood or buying one, but now that I have seen these, this would be a much better choice. Low maintenance is the seller for me. I believe I will have to go with one of the bigger sizes to be able to fit most of my wife’s stuff in there. Don’t tell her I said that. Thanks for your knowledge. 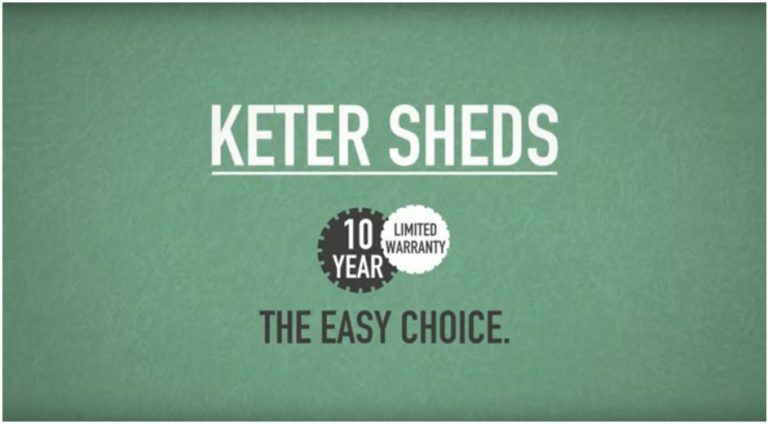 Thanks for dropping by and reading about Keter’s range of Low Maintenance Factor sheds. We too were unaware regarding a plastic/resin manufacture however due to the constant yearly maintenance hassles our last wooden facility demanded caused us to look around for an alternative solution due to time restraints. Metal and plastic sheds were the alternative, the effortless wash down to re-sparkle the facade, integrated air vents maintain a preserved environment, built-in floor keeps inside clean whilst the weatherproof design resistant to dents, rust and decay is what turned our attention towards a resin composition upon inspecting both varieties. Ha – Yeah we all collect so much stuff nowadays, it’s where to store indoors what’s causing the problems due to room inside most homes being at such a premium, having a facility stood outside serves the convenience to accommodate outdoor storage where you need it most – Outside. If you’re after a large size, not wishing to spend a fortune and have room to locate the dimensions, the Factor range has sizes to suit most circumstances, up to 8 x 11 ft which fits an incredible amount of gear. The fact that these can be power washed is a big plus for me. No need to worry about mold since it’s not wood or other organics that are susceptible to mold. The look is nice too. I think the 6×6 is probably the most suitable for me personally since I have some projects to do but not too much. Yeah, this is the beauty of the plastic/resin variety, they’re low maintenance – All it takes is a wash down when dirty to bring them back looking pristine again. If you are power-washing, go easy around the vents as obviously water will enter into the shed if you power up inside the vents. Any stubborn marks as mentioned can be removed with a hot bucket of water with some washing up liquid. Add a couple of cups of white vinegar if anything is ingrained into the plastic. 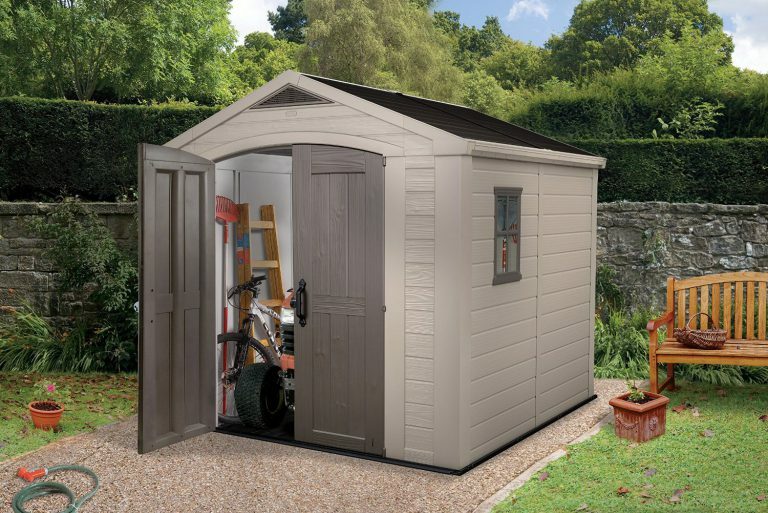 Yes, the Factor 6×6 is a popular shed as the size and storage options do suit a lot of people with the added benefit of a very competitively priced storage facility. Wow, I had no idea I would be able to fit a smaller shed outside my tiny apartment. I moved into a new place and my mountain bike has been sitting outside for months! Definitely looking into this. Thank you for the information! Do you know how many years these sheds can last? I am presuming you’re looking at the 6×3 or 6×4 Keter Factor here when you say small shed. Yeah, the 6×4 is very popular for storing bikes as it’s deep enough and has a small side door that provides even better access if needed. I certainly see your point with leaving a bike outside as this will start rusting over time being subject to the ever changing weather conditions. How many years will plastic last? The longevity of Plastic / resin is really indefinite as it’s weather-resistant and durable to the ever changing weather conditions, reason it’s becoming a popular alternative to the wooden variety due to the yearly maintenance duties associated with them.